Deviled eggs are one of my favorite snacks. When someone makes them in our house, they are gone before they have time to chill. So I wanted to try a different kind of deviled egg recipe to make it healthier and more flavorful. 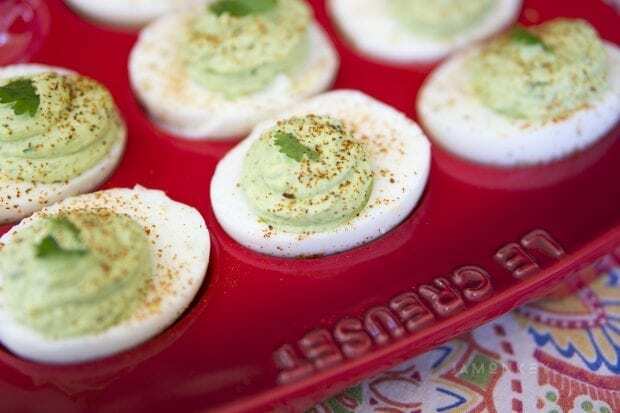 These spicy avocado deviled eggs are delicious. Making the perfect hard boiled eggs are the secret. My husband prefers the cold to boiling water method, but I prefer this one. Bring about 4 cups of water and 1 tbsp of vinegar to a rolling boil. Add the eggs, being careful to place them in gentle. A wire strainer is good for this. Reduce the heat to a simmer and allow the eggs to cook for 15 minutes. Place the eggs into an ice bath for 5-10 minutes until the eggs are cooled. Then they should peel much easier. After scooping out the egg yolks, I substituted mayo with plain Stonyfield Greek yogurt and half of an avocado. I then mixed in pickled jalapenos, cilantro, and some lime juice to give it a Spanish kick! Finished off with a sprinkle of cayenne pepper to round out the spicy flavor profile. I blended everything in my Blendtec and then piped the mixture, but you could also use a potato masher to make this chunky and simply spoon the mixture into the eggs. 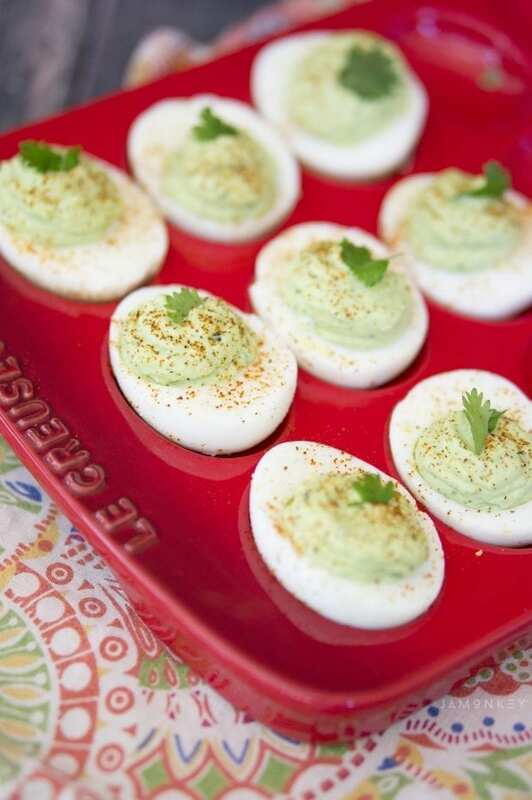 Either way is yummy; some people just prefer chunky deviled eggs. It has the added bonus of different textures that crunch. I had some handy tools for this recipe including the KitchenIQ non-slip cutting boards and stackable measuring cups. I also received this beautiful Le Creuset deviled egg tray. 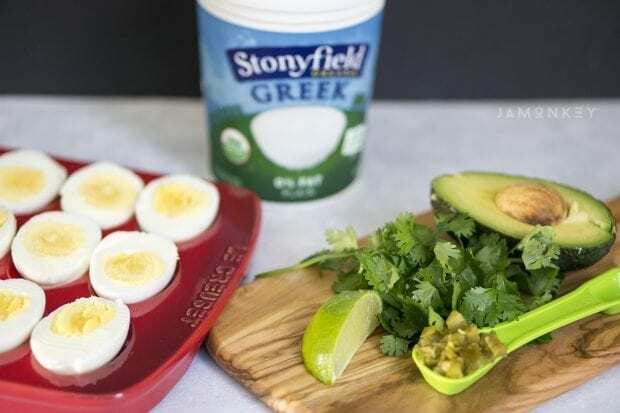 It is from their stoneware line and you can use it in the oven to bake your hard boiled eggs, just remember to place them into an ice bath when you take them out of the oven. I'm obsessed with the Le Creuset line, I have one of their “One Pot's” and I use it all the time. Hard boil eggs, peel and cut in half. 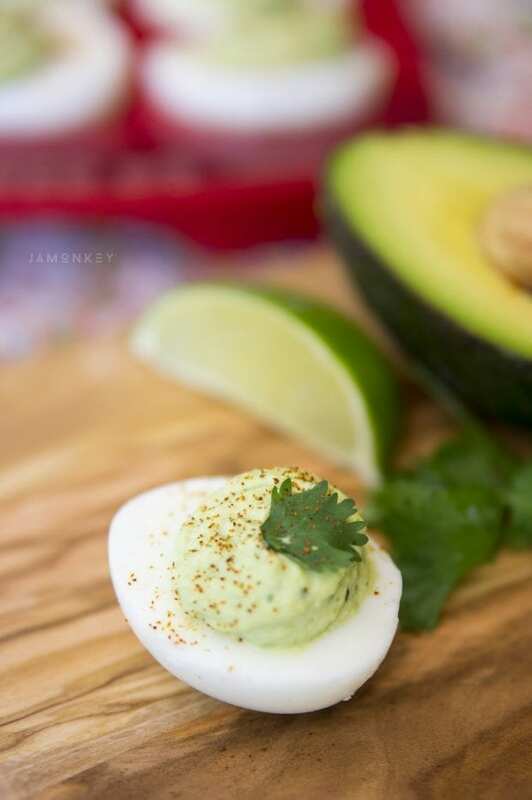 Add in pickled jalapenos, cilantro, avocado, Greek yogurt, and squeeze the juice from your quarter of lime. Blend (or mash) ingredients together until well blended. Pipe (or scoop) mixture back into the egg whites. Sprinkle with cayenne pepper and garnish with cilantro. These would be my Mom’s dream snack. 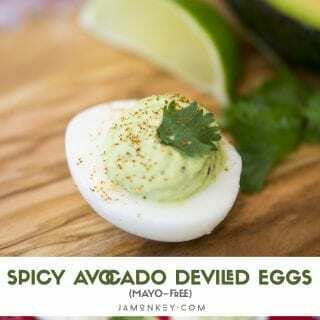 Spicy, good fats, and she loves deviled eggs!